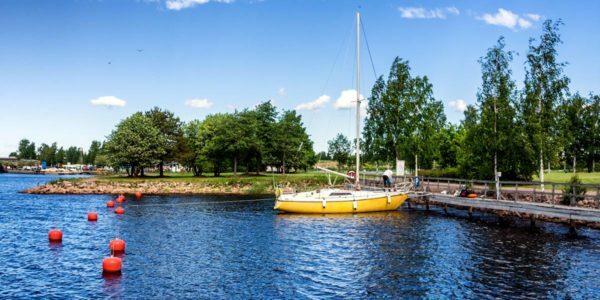 Hamina and Tervasaari marina Rampsi - Sail in Finland! Hamina (Fredrikshamn in Swedish) is the eastern-most Finnish city on the shores of the Gulf of Finland. Even the name of the city demonstrates its a long seafaring tradition, Hamina comes from the Swedish word “hamn” (as in the latter part of city’s Swedish name) which means “harbor”. 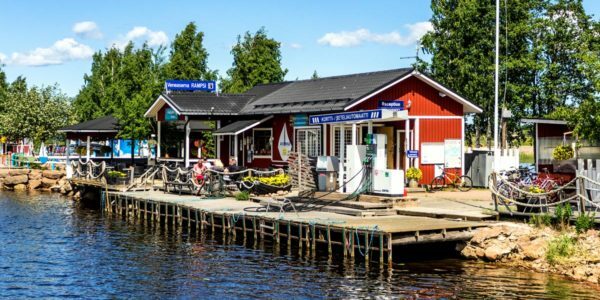 The Hamina marina Rampsi on the island of Tervesaari carries on the city’s maritime legacy. The red ship on the left is the lighthouse ship s/s Hyöky. The history of Hamina is connected to its position close to the Finnish/Russian border. Hamina first got city rights under Swedish rule. Sweden had lost the important harbor city Vyborg (Viipuri) to Russia in 1721. Sweden needed a new trade and harbor city to replace the loss. 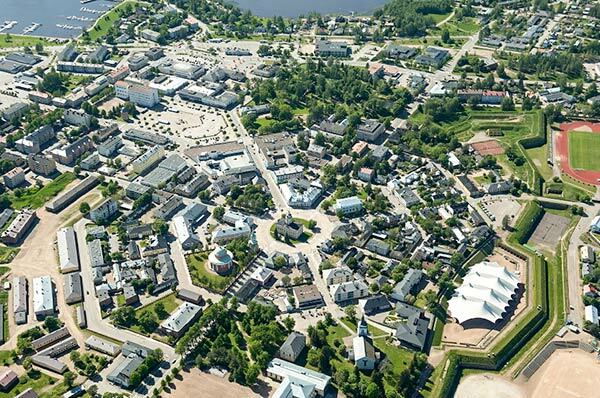 The new city was built within star-shaped bastion walls and got a unique circular layout that is still one of Hamina’s main attractions. The Swedish reign only lasted some 20 years and in 1743 Hamina was surrendered to Russia as the result of yet an other war. Hamina again become a border town, but this time on the Russian side of the border. In 1809, Hamina plays a small but visible part in Finnish history. Sweden had again lost a war with Russia and this time peace came at a high cost, all of Finland was surrendered to Russia. The peace treaty was signed in Hamina and is known as “Freden i Fredrikshamn” (“Haminan rauha” in Finnish, literally “the peace in Hamina”). Finland now became a (semi)autonomous Grand Duchy under Russia and both Hamina and Vyborg became part of the new Finland. The peace treaty and the formation of the Grand Duchy were significant for Finland as it can be seen as the first time that Finland emerges as an independent region with roughly its current extent. 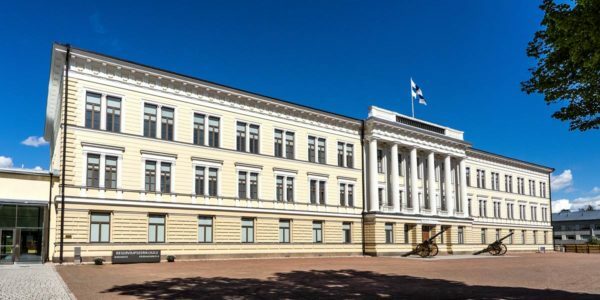 If you ask Finns about Hamina today, the first thing most Finns will think of is the Reserve Officer School located in the city center. Hundreds of Finnish young men, and recently also women, pass through Hamina each year as they train to become officers in the Finnish army. 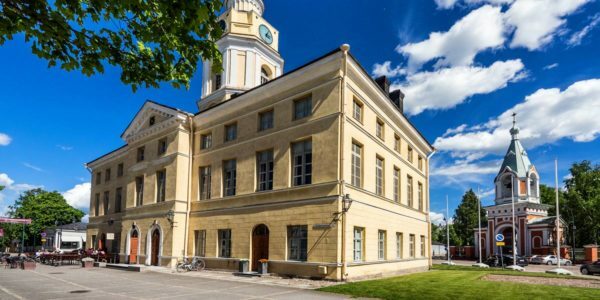 The Reserve Officer School is still one of the most impressive building in Hamina. The second thing that Hamina is known for is the bi-annual Hamina Tattoo International Military Music Festival, the biggest marching and military band event in Finland. The next Tattoo will be held in 2018. The Hamina townhall and the Orthodox Church at the back are just a few of the historic buildings in the well preserved city center. The city center has retained the circular layout and in particular the central square with the Town Hall (renovated in 1840 by the famous Finnish architect C. L. Engel) and many churches is very beautiful. Hamina is easily accessible by boat. The city marina, Rampsi, is located on the Tervasaari (“Tar island”) peninsula just outside the city walls. The name Tervesaari refers back to the times when tar was one of the most important exports of Finland. The marina has berths for about 35 boats. Sailing boats are requested to use the jetty with buoys in the small bay just before the marina buildings. Bigger vessels can use the quay and for smaller boats that can pass under the bridge just after the marina (7 meters free height), there are some additional berths available. Jetty with buoys just as you enter the Rampsi marina. The services on Tervasaari are good. There are the normal marina services like saunas and showers, a filling station, two cafes also serving light meals etc. In addition there is a very nice beach at the tip of the peninsula and a small playground for kids. 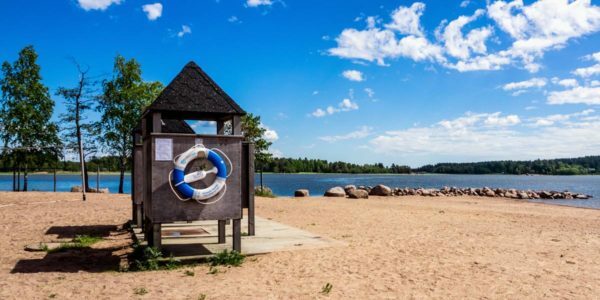 Tervasaari beach is a few meters from the marina is the perfect place to spend a hot summer’s day. Shopping and tourist activities are not far away, the walk into town is about 500 meters. If you need to fill up your fridge, there are a couple of a food markets (S-Market and K-Market) in the city center. 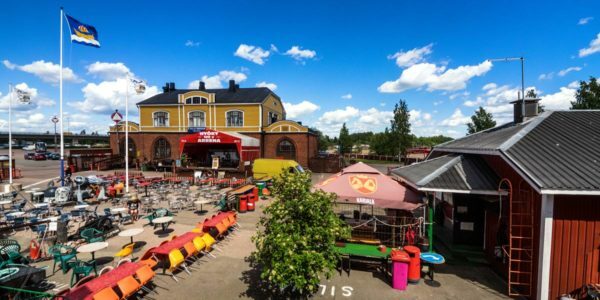 If you need to do a crew change or want to explore nearby Kotka or zip to Helsinki, you can reach Hamina by bus, the bus station is also in the center of the city. The most unusual thing in Tervesaari is the small “empire” of Hamina’s #1 eccentric, Patu Patanen. 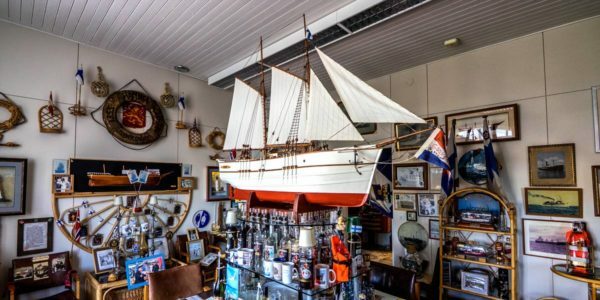 Patu (aged 70+ years) runs a rustic tourist setup which includes the former lighthouse ship s/s Hyöky, the former harbor and customs office building doubling as a museum and as a restaurant (also the home of Patu) and an outdoor stage and bar between the two. Patu Patanen’s “empire”. At the back the former harbor and custom’s office, to the right the bar. Picture is taken from the deck of s/s Hyöky. Patu has declared Tervasaari an independent island state. In his little empire, he offers all kinds of services ranging from outdoor concerts with famous Finnish artist to the option to live aboard s/s Hyöky (in fairly rough but cheap conditions). The office building hosts a museum of all things Finnish and maritime that simply defies classification but is the work of years of collection. No visit to Hamina is complete without a drink in Patu’s bar and a tour (ask to be let in) of Patu’s museum. 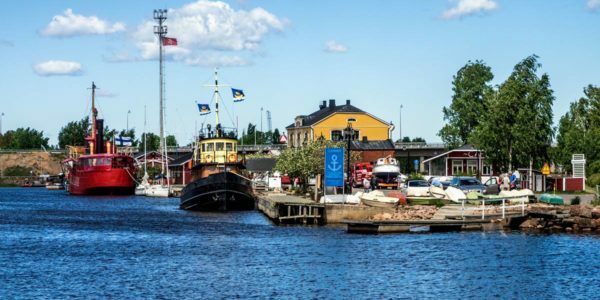 Here is a video to help you navigate into Hamina and the Rampsi marina. For more information on Hamina, see www.visithamina.fi.